You can get your pharmacy to package your medications into morning and evening… doses of all your medications in sealed plastic bubbles. I have 10 prescription medications, plus Immodium, plus vitamins and probiotics. It helps manage the prescription medications. You don’t have to manage refills of all your different medications. The pharmacy talks to doctors for you to get the refills and tracks when you need them. Your doses contain all the pills and no duplicates. The pharmacy is more accurate than you in preparing a week’s doses. If you drop your blister pack, the pills stay sealed in their pouches. You don’t have a giant pile of pills to sort out. If you spill coffee on your blister pack, the bubbles protect your pills. The blister pack is light weight for travel. You have to get a new blister pack delivered every week. They don’t give you a couple of months supply because even a tiny change in your prescriptions would invalidate the packs. If there is an earthquake, you will usually have only a few days supply. If anything goes wrong with delivery, you are out of everything, not just one drug. You have to be home one evening a week to accept the delivery. If you miss a dose, there is no way to get back in sync except by wasting pills. You press to burst an aluminum seal on the bubble. It can suddenly give way spraying one dose on the floor. At least it is not the whole tray. Blister packs do not handle your non-prescription medications and vitamins. 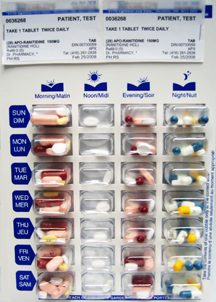 Blister packs do not handle medications you do not take regularly, e.g. gout medication. My pharmacy prepares blister packs at no charge. Yours may charge a fee.